New CAPS DS encapsulation prespray is the perfect product for any commercial setting. This product has been a leader in the Newline brand of chemical since day one. 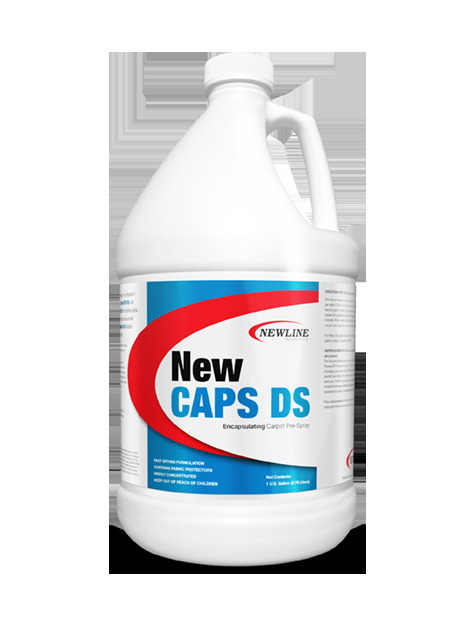 New CAPS DS contains the newest technology in surfactant polymer chemistry that provides an incredible clean. Commercial jobs are now profitable with encapsulation technology and even more when you have a product that works, thanks to the great double concentration and coverage of over 1,000 square feet per RTU gallon. Fast drying with fabric protector. Highly concentrated. Directions for use: Pre-vacuum carpet. Dilute 4 oz. per gallon in a pump/electric sprayer. Spray carpet at 1,000/gallon. Allow 5 minutes of dwell time and then scrub or brush the area. Allow 20 - 30 minutes of dry time before opening area up to foot traffic. Vacuum area when completely dry to remove encapsulated soils.